Imagine ordering an icy "caipirinha" on the beach at Ipanema, all in Portuguese! 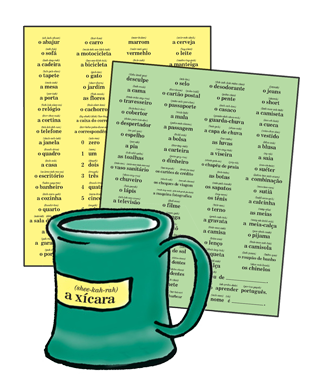 The ever-popular PORTUGUESE in 10 minutes a day® Book comes with interactive software, full of fun computer activities including interactive Sticky Labels, Flash Cards and more! You'll learn everything you'll need for your travels, from making reservations to ordering a meal and finding your way around town. This book/software combo is not just another language book for your shelf; it's a complete, and fun, hands-on language learning experience that will help you live your travel adventures! Designed to look like a child's workbook, the 10 minutes a day® book is an approachable and fun program for everyone. It covers the material equivalent to more than a year of high school Portuguese or the first quarter of Portuguese at university. It's a refreshing alternative to boring textbooks and you'll be surprised at how much you learn. Use the book to guide you, step-by-step, through learning and speaking Portuguese. With the Guide and simple phonetics above each Portuguese word, it's easy to begin speaking Portuguese with the correct pronunciation. Sounding similar to their English counterparts, these Portuguese words take no extra effort to add to your vocabulary. You can quickly look up a Portuguese word, its pronunciation and definition. PORTUGUESE in 10 minutes a day® and PORTUGUESE a language map® focus on the Portuguese spoken in Brazil. There are some differences in vocabulary and pronunciation between Continental Portuguese and Brazilian Portuguese, however, each is understood by the other. A fair comparison would be British English to American English. Forms of verbs, nouns and adjectives are generally the same. The differences are most apparent in the choice of vocabulary and syntax, particularly in the spoken language. Continental Portuguese tends to have a softer sound, and often the word endings are swallowed. Brazilian Portuguese does not swallow the word endings, and the vowel sounds are clearly pronounced. The nasal sounds tend to be more heavily nasalized in Brazilian Portuguese. In Brazil the letter “r” is pronounced as an “h” at the beginning of a word so the name of the world-famous city of Rio is actually pronounced “hee-oo.” In addition, an “s” at the end of a word will vary in pronunciation depending upon which area of Brazil someone is from, as well as whether someone is from Brazil or Portugal.